Many devices are now gotten up for shoeing kicking horses. It is no use for a man to wrestle with a horse, and every horse shoer should try to find out the best way to handle vicious horses. One simple way, which will answer in most cases, is to put a twist on one of the horse's lips or on one ear. To make a twist, take a piece of broom handle two feet long, bore a half-inch hole in one end and put a piece of a clothes line through so as to make a loop six inches in diameter. Another way: Make a leather strap with a ring in, put this strap around the foot of the horse; in the ring of the strap tie a rope. Now braid or tie a ring in the horse's tail and run the rope through this ring and back through the ring in the strap, then pull the foot up. See Figure 16. 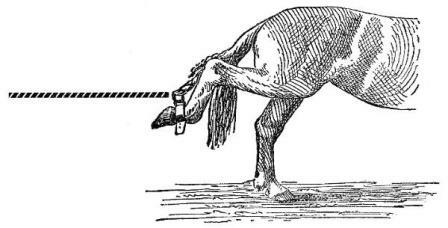 The front foot can be held up by this device also, by simply buckling the strap to the foot and throwing the strap up over the neck of the horse. Shoeing stalls are also used, but they are yet too expensive for small shops. 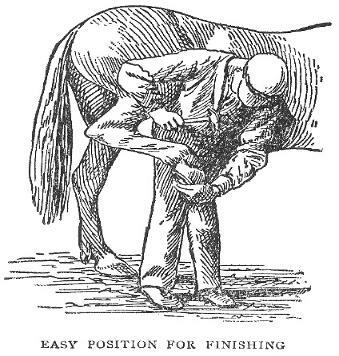 No horse-shoer should lose his temper in handling a nervous horse and abuse the animal; for, in nine cases out of ten, will hard treatment make the horse worse, and many horse owners would rather be hit themselves than to have anybody hit their horse. Don't curse. Be cool, use a little patience and you will, in most cases, succeed. To a nervous horse you should talk gently, as you would to a scared child. The horse is the noblest and most useful animal to man, but is often maltreated and abused. Amongst our dumb friends, the horse is the best, but few recognize this fact. In shoeing a trotter it is no use to follow a certain rule for the angle, because the angle must vary a little in proportion to the different shape of the horse's foot. Every owner of a trotter will test the speed by having shoes in different shapes and sizes, as well as having the feet trimmed at different angles, and when the angle is found that will give the best results the owner will keep a record of the same and give the horse-shoer directions and points in each case.